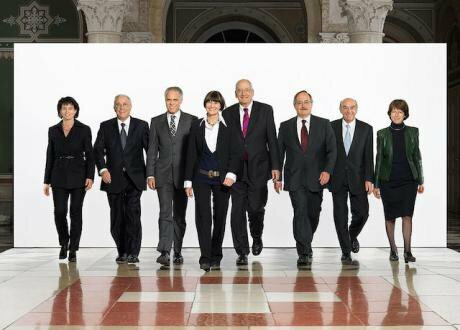 The Swiss Federal Council, 2007. 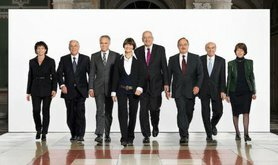 (SVP) Christoph Blocher is second from the left. Wikicommons. Some rights reserved. The SVP (Swiss People's Party) is Switzerland's largest political party. This was not always the case. Until the 1990s, the SVP garnered around 10 percent of the popular vote. As the traditional representative of Switzerland's farming interests, it was the junior partner in Switzerland's consociational government where it held one seat. Although a national party, the SVP had its strongholds primarily in the cantons of Zurich and Berne, plus a number of smaller, predominantly German-speaking cantons. All this changed once Christoph Blocher (SVP Zürich), one of Switzerland's richest entrepreneurs, established himself as Switzerland's leading – and most controversial – politician. Under his leadership, the SVP morphed into a right-wing populist party, promoting itself as a the defender of Swiss sovereignty (against the EU) and national pride (against foreign and domestic detractors questioning Switzerland's less than stellar role during the Second World War). But above all, the party made its mark as a staunch critic of Switzerland's migration policy. Charging that the country had lost control over immigration, the SVP called for "measured immigration" by severely curtailing the influx of migrants of all provenance, but particularly Muslim countries. Claiming that Islam was incompatible with Switzerland's constitution and Rechtsstaat, the party made it its avowed goal to strictly limit Islam's impact on Swiss society and culture. It was in this spirit that the party – initially rather reluctantly -– supported the anti-minaret initiative, which Swiss voters passed by a slim majority in 2009. The SVP's populist turn and particularly its radicalization on the questions of migration and national cultural identity not only led to a substantial surge in electoral support; it also engendered a revitalization of existing local cantonal party organizations and the formation of new organizations (particularly in parts of Suisse romande, i.e., the French speaking-region of Switzerland). By the end of the first decade of the new century, the SVP successfully contested elections throughout the country (one notable exception has been the Italian speaking canton of Ticino, where the party has had to deal with an overpowering "indigenous" populist rival – the Lega dei ticinesi). Switzerland is a relatively small country, its political system quite arcane for outside observers. The Swiss take great pride in their version of direct democracy – even if (often abysmally low) participation rates in local, cantonal and national initiatives and referenda might create a different impression. This has not prevented radical right-wing populist parties such as the Front National (under Marine Le Pen) and Germany's AfD, from touting Switzerland around as a model of "genuine" democracy. And yet, this seemingly exemplary model of direct democracy – where even the construction of a new road bypassing a small town is subject to a local referendum – boasts one of western Europe's most successful right-wing populist parties. Populism is all about "returning voice to the people," or so the Front National has famously charged. What, then, explains the success of populism in the land of direct democracy – and, one might add for good measure, one of the richest countries in the world? 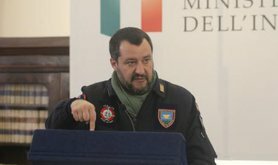 The Swiss case suggests that the right-wing populist insurgency that has occurred throughout western liberal democracies over the past several decades has little to do with promoting "more democracy" – a legitimate demand given the pervasiveness of technocracy and TINA; rather, it has a lot to do with reversing, once and for all, what the right considers the nefarious influence of 1968, which in their view has undermined traditions and poisoned the moral fabric of western democracies. The objective is once and for all to defeat the post-68 left and regain the strategic heights with respect to the production of meaning – what the Italian Marxist intellectual Antonio Gramsci (persecuted and imprisoned under Mussolini) once referred to as "cultural hegemony" and what in German is known as Deutungshoheit (power of interpretation). In recent years, it has become blatantly obvious that meaning is subject to profound struggles and conflicts. The spectacular career of the notion of "fake news" as a major new field of contestation is perhaps the clearest reflection of the central importance of interpretation in contemporary politics. 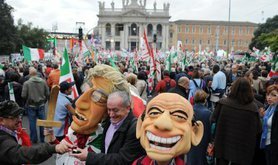 Recent studies on the latest wave of the right-wing populist upsurge suggest that culture rather than economics is at the center of contemporary right-wing populist mobilizations. Right-wing populist voters are less concerned about unemployment, cheap imports from emerging economies such as China or having to compete with low-wage workers than about the dissolution of familiar life-worlds and a shared identity. What gets them riled up are not so much T-shirts made in Vietnam and hawked in neighborhood shopping malls as mosques and minarets disturbing the idyllic skyline of small-town Switzerland, Austria, and elsewhere. Astute right-wing intellectuals were quick to understand the strategic importance of culture. In the 1980s, "new-right" intellectuals such as Alain de Benoist in France, Karlheinz Weissmann in Germany and Marco Tarchi in Italy were instrumental in appropriating Gramscian thought and disseminating key terms such as "metapolitics" among right-wing circles. Karlheinz Weissmann, for instance, insisted as early as 1988 that in pluralist societies, the influence of political groups is as much determined by holding actual political power (if not more so) than by occupying the "pre-political space"(i.e., the realm of ideas and meaning) – a feat, Weissmann held, that the left in Germany had accomplished in the years following '68. Two years earlier, at the height of the Historikerstreit (pitting German intellectuals against each other over the question of how to deal with the Nazi past) one of the main protagonists, the historian Michael Stürmer, pithily put into words what this implied: in a country (like Germany) where the people were searching for orientation and identity, Stürmer maintained, only those who "fill the memory, define the terms and interpret the past" are in a position to take charge of the future. Alain de Benoist and his acolytes on the intellectual right were more than skeptical about the chances of success of electoral politics as pursued, for instance, by the Front National. Instead, they advocated a "cultural revolution from the right" conceived as a process of value change best advanced through protracted right-wing metapolitical indoctrination. The cultural revolution never came even close to materializing, largely because the new right never managed to disseminate their ideas to a broader audience. New-right magazines, such as Benoist's Eléments (which is still around) and the German magazine Mut (which ceased publication in 2017) were too intellectually challenging to appeal to ordinary people. Ironically, however, their ideas were picked up by political parties of the populist right. Jörg Haider, for instance, stated as early as 1993 that it was his main political priority to effect "an Austrian cultural revolution with democratic means" designed to "depose both the ruling political class and the intellectual caste (Kaste)." Some twenty years later, the objective on the populist right is still the same – to achieve cultural hegemony by demolishing the heritage of '68. As Jörg Meuthen, a leading official of the German AfD put it at the AfD party congress in 2016: "We want to get away from this left-wing-red-green contaminated '68-Germany." The response from the audience was roaring applause. This led one outside observer to note that the AfD was to a significant extent an expression of the attempt on the German nationalist right "to take revenge for '68" by reversing the "humiliating historical defeat" at the hand of the '68 generation. Their greatest crime in the eyes of the nationalist right: to have instilled a political culture informed by guilt over the past. Hardly surprising, leading AfD politicians have made statements intent on playing down and trivializing the Nazi period, arguing, among other things, that it was a small speck in an otherwise glorious history. The choice of words reminds us of Jean-Marie Le Pen's infamous characterization of the Holocaust as a "detail of history." 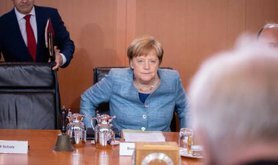 That German politicians would go to those lengths suggests that right-wing populism is to a significant degree driven by long-smouldering resentment – that obsessive emotion grounded in a profound sense of powerlessness, injury and injustice. In the burgeoning literature on the populist right, this aspect has so far not been sufficiently appreciated and explored. Yet its importance for understanding the motivational impetus for contemporary right-wing populist mobilization is indisputable. This takes us back to the SVP. The SVP's dramatic upsurge in the 1990s came in the wake of the party's embarking on a large-scale course of populist mobilization, which directly morphed into a frontal assault on '68 and its pernicious legacy. For the SVP, as one leading party official put it, the'68 movement was a "destructive brew" which made "its own laziness into a program" resulting in the decay of traditional virtues such as reliability, hard work and discipline. It changed Swiss society in so fundamental a way as "the SVP would like to do, but luckily has not managed to do as yet." It created a society devoid of "moral and cultural values, role models, myths and religious content" where egotism and narcissism run rampant. The SVP has clearly set itself the task of reversing these developments and returning the country to an age where order, discipline and hard work were the order of the day. This program has a certain appeal in small towns hit hard by the construction boom of the past two decades which has transformed them beyond recognition and left in its wake congested streets, the disappearance of free parking, and the replacement of traditional businesses by fast food chains; but also in larger cities such as Lausanne and Geneva, which have major drug and security problems. A growing number of Swiss citizens are tired of the proliferation of American-style factory outlets along the major highways and large supermarkets where you are more likely to hear English spoken than French or German; and of the fact that the country's train system no longer runs as smoothly as it once did. None of these developments has anything to do with the ‘68 generation. They are rather the result of local governments and administrations eager to attract companies and international organizations in order to increase their revenue base by offering them all kinds of tax incentives. SVP politicians have been as complicit in promoting excessive development with all of its negative consequences as have been the politicians of other parties. The frustration, anger, indignation and resentment provoked by the results, however, have primarily benefited the SVP, which in turn has used its electoral capital not to address the country's real problems, largely linked to excessive development, but to promoting anti-‘68 nostalgia for a world that seems irretrievably lost.